Chuck Berry was probably the most influential artist from the early days of rock and roll, in terms of the impact that his music had on the evolution of the genre. Before Chuck Berry arrived on the scene the guitar was mainly a background instrument in rock and roll and rhythm and blues. In the early 50s the dominant instruments in the genre were the saxophone and the piano. Chuck's topical lyrics, combined with his legendary guitar riffs, set the model for the rock and roll style of the 60s. Virtually every guitar playing rock artist that came after him was influenced greatly by his style, as rock and roll became a guitar dominated genre by the mid-60s, and has stayed that way ever since. Chuck exploded on to the scene in the summer of 1955 with his debut single, a song called "Maybellene" (originally called Ida Red) that shot right to the top of the R&B charts, staying at #1 for ELEVEN weeks in the summer and fall of that year. It also broke into the top ten on the Billboard pop chart, which was incredible for a rock and roll song by a brand new artist in 1955, a time when most R&B and rock and roll songs were still not breaking into the mainstream pop market. "Maybellene" peaked at #5 on the pop chart, and proved to be immune to the pop cover versions by white artists that plagued most black artists of the day, as a couple of lame cover versions failed to even make the charts. He went on to release several of the greatest rock and roll classics of all time over the next 5 years or so, before doing a stretch in prison in the early 60s for a violation of the Mann Act. Upon his release from prison in late 1963 he made a strong comeback with several hit records in 1964. Chuck has actually spent time in jail on four different occasions, first in the late 40s, and in later years for tax evasion and drug possession. He's also been in trouble at times for other offenses, usually having to do with young women, like the time they discovered him videotaping his female employees in the bathroom at his amusement park. Chuck Berry passed away March 18, 2017 at the age of 90 of 'cardiac arrest' at his home in St. Charles County, Missouri. John Lennon - "If you tried to give rock and roll another name, you might call it 'Chuck Berry'." Joe Perry (Aerosmith) - "Berry's On Top is probably my favorite record of all time; it defines rock and roll. A lot of people have done Chuck Berry songs, but to get that feel is really hard. It's the rock and roll thing--the push-pull and the rhythm of it." Stevie Wonder - "There's only one true king of rock 'n' roll. His name is Chuck Berry." Jerry Lee Lewis - "[My mama] said, 'You and Elvis are pretty good, but you're no Chuck Berry." Keith Richards - "To me, Chuck Berry always was the epitome of rhythm and blues playing, rock and roll playing. It was beautiful, effortless, and his timing was perfection. He is rhythm supreme. He plays that lovely double-string stuff, which I got down a long time ago, but I'm still getting the hang of. Later I realized why he played that way--because of the sheer physical size of the guy. I mean, he makes one of those big Gibsons look like a ukulele!" Here's a great story about Chuck Berry to illustrate just how electrifying he was as a live performer. 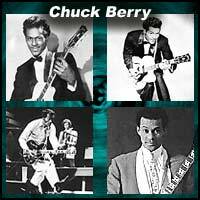 In 1972, Chuck recorded a partially live album called "The London Chuck Berry Sessions." The live portion of the album was recorded at the Lanchester Arts Festival in Coventry, England, with the Average White Band backing up Chuck for the show. This is where he recorded the song that was ironically to become the only # 1 pop chart hit of his career, a novelty thing called "My Ding-A-Ling," which was done originally by Dave Bartholomew back in 1952. As it got towards the end of his set, he went into a version of "Bye Bye Johnny," a song that was sort of a sequel to "Johnny B. Goode." After the first verse, the audience starting singing "Go, Johnny, Go, Go" as Chuck got to the chorus. Chuck picked up on it, and switched over to "Johnny B. Goode" without missing a beat. This became his encore as it went on for several minutes. When the song ended the audience was going absolutely crazy clamoring for more Chuck Berry. The announcer was trying to calm the crowd down saying, "He's overrun 15 minutes.... look, there's about two thousand people outside waiting for another concert, I'm sure lots more of you are going to come back in to see the Pink Floyd, we don't get a Pink Floyd concert if we don't we clear the place, it's as simple as that." Apparently the audience did not seem to care about the Pink Floyd, as they continued to clap and scream and refuse to clear out, seemingly not interested in this "Pink Floyd" that was due on next. Such is the power of Chuck Berry live on stage! In 1977 the United States sent a Voyager Space Probe deep into outer space, hoping for it to reach another galaxy, and perhaps even reach some other forms of life somewhere out there. The probe contained a bunch of items to illustrate what the culture on Earth was like. As part of the cultural package they picked one record to represent rock and roll, and that record was "Johnny B. Goode" by Chuck Berry. A while after that there was a skit on the TV show "Saturday Night Live." The premise of the skit was that Earth was about to get the first ever message from another life form in outer space. They had this big buildup to the message being received and decoded, translated, etc....finally they read the message out loud. The message from outer space was SEND MORE CHUCK BERRY! Various songs by Chuck Berry are listed numerous times on many DDD song lists, including "Johnny B. Goode" as the # 1 song on the "Greatest Rock Songs" list, and also as the # 1 song on the "100 Greatest Rock 'n' Roll Songs Of The 50s" list, where Chuck has 7 songs in the top 100. He also has several songs on the "Greatest Guitar Riffs" list and the "Greatest Rock Anthems" list.